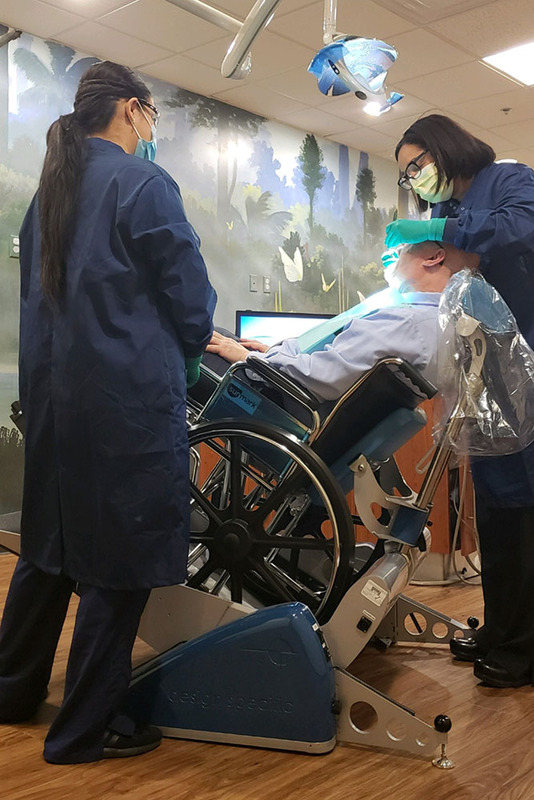 Sun Life Dentistry now offers a multifunctional dental chair that will enable appointments that are more comfortable for patients who cannot be accommodated in a regular dental chair because of weight or mobility issues. The chair has the ability to act as a wheel chair lift, eliminating the need for patients who are wheelchair-bound to transfer out of their own chair. It is important for everyone to see the dentist at least twice a year. Many dental problems will only become detectable to you once the issue is in advanced stages and is causing pain or infection. Visiting the dentist can help catch problems early on so that simpler, and often less costly, treatments can be done to avoid more serious problems in the future. Additionally, regular dental care also helps in the detection of oral cancer. Aging populations and patients with complex medical conditions are especially at risk for these types of issues. Even patients without teeth need to be checked for oral cancer at least once a year, and several studies have linked poor oral health to diabetes and cardiovascular disease. Poor oral health can inhibit a person’s ability to eat or speak and may also have psychological effects. Dental disease can often lead to infections that may have serious consequences if left untreated. Sun Life is dedicated to providing access to care for all patients, and with the addition of this chair, we are making dental care more accessible for our community. The multifunctional dental chair is available to adults and children alike, and is located at Sun Life’s Pediatric Dental office. To learn more about the multifunctional chair, or make an appointment, call Sun Life Family Dentistry, 520-381-0381, or Sun Life Pediatric Dentistry, 520-350-7560. When scheduling an appointment, please mention your need to use the multifunctional chair.